Today is World Hepatitis Day, so it's the perfect time to highlight the work of the NHS Infectious Diseases in Pregnancy Screening (IDPS) Programme's national hepatitis B in pregnancy audit. We commission the audit from the population, policy and practice programme at the University College London (UCL) Institute of Child Health. It collects outcome data on all 3 of the diseases we screen for – HIV, syphilis and hepatitis B. "The audit aims to measure current practice in the care of pregnant women with hepatitis B against IDPS programme standards. Results of the audit will highlight aspects of service provision that require improvement. This will help us optimise strategies to prevent hepatitis B being passed from mother to child in the UK. "An estimated 4 out of every 1,000 pregnant women in the UK have chronic hepatitis B infection. This increases to around 10 in every 1,000 in London. Transmission of hepatitis B from mother to baby can be prevented in 90 to 95% of exposed infants. This involves infant vaccination starting at birth for all, with the addition of hepatitis B specific immunoglobulin (HBIG) at birth and maternal antivirals in late pregnancy for those at high risk of transmission. Newborn babies infected with hepatitis B have a very high risk (>80%) of developing chronic infection – much higher than if the virus is acquired in adulthood. 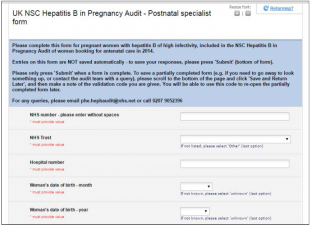 "The audit includes around 2,600 women with hepatitis B who began their antenatal care in England in 2014. Just under half of these women lived in London, and around 70% had a hepatitis B diagnosis that pre-dated their current pregnancy. We have nearly completed the collection of maternity unit data on these women’s antenatal care and pregnancy outcomes. "The next step in this audit is to collect data from specialists on the care of high risk women, now they have delivered. This will take place over the next couple of months. We will collect information on laboratory test results including co-infections, liver disease staging and investigations (if available), and treatment for hepatitis B. "The audit team will work in partnership with the PHE Immunisation, Hepatitis and Blood Safety department to link the audit data with information on completion of the vaccination schedule among high risk infants. This will provide important insights into factors associated with the vertical transmission of hepatitis B from mother to baby, including incomplete vaccination and loss to follow-up." The audit team has started to analyse the data from maternity units and expects to report results in full next year. The team also has a stand at the upcoming IDPS regional workshops so please come along and say hello.